Biofouling is the uncontrolled growth of organic matter in a technical environment. Biofouling develops on existing biofilm and spread the biomass with the fluid downstream. Biofilms form at interfaces. At the water / air interface, which is a open water surface. Or in our case at the water / pipe – boundary surface. Biofilm formation start with a small inpurity coming with the water or other fluid in the system. This inpurity, a bacterium in the feed water or dead algaes from a cooling tower, settle in a spot with less flow and the process of biofilm formation start. The biofilm is mostly gelatinous, slimy films of microorganisms. It might be bacterial or other microbial organism. Sometimes pathogen as for instance legionella, but in most cases not. If mature biofilm can develop undisturbed, it will spread in all directions. Horizontal along the pipe, vertical in the height. Plateus are forming. If such plateaus reach a certain height, parts of the biomass are torn off by the current. And then transported with the water in flow direction. This torn parts of the biofouling settle somewhere else in the water system and start a new biofilm formation. We talk in this article not about biofilm infections caused by bacterial biofilms in catheters or other medical devices. This is an issues in the medicine, but Merus concentrates on water systems. Even if technical speaking, these two things are be related. Biofilm formation is not only found in drinking water, but increasingly in technically used industrial water. This means in cooling circuits, cooling towers or heat exchangers. Even in water used for production bacterial biofilms occur. 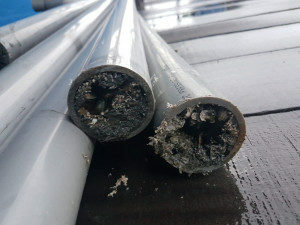 The consequence of this, the higher the demand on the purity of the water, the higher the effort to avoid such biofilms or at least to control them. We also had cases where the biofilm contained microorganisms that released very aggressive secretions. This in turn led to considerable corrosion damage in the system. 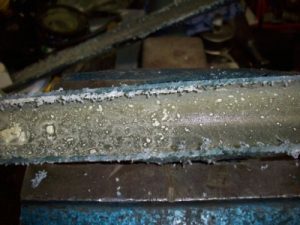 This phenomena is called MIC – Microbiological Induced Corrosion. It becomes problematic when whole „plates“ of biofilm are loosened and pressed through the pipe. This results in a plug which can lead to blockages at narrow points in the system. Or lead to biofilm and biofouling again in uncontaminated parts of the system. The common way in the industry to avoid biofilm is the use of biocides. Biocides are chemicals that combat all types of living organisms in a water system. The results achieved through the use of biocides do not always make customers happy. It’s the same as with all chemical dosages, you have to reach every corner of a water system. And this task is very difficult to solve with large and complex pipe constructions. In order to remove already existing biofilms, the classic method is heat or acid treatment. However, this is very complex and therefore expensive. One of the main problems with classical rehabilitation is to ensure that all areas of the pipe network are flushed. As explained above, this is very difficult to impossible. As an example, if you have to make heat sanitisation in a hospital or hotel, you have to ensure that no guest is using the tap point during this sanitisation. To ensure to kill biofilm bacteria the water has to have minimum 60°C. If you like to achieve 60°C on the 10th floor of a building, the water have to have at the boiler in the basement, usually more then 80°C. However, if not all microorganisms are killed during this remediation, biofilm formation begins again after a short time. Merus has developed special bio rings for the treatment of different biofilm composition. With these Bio Rings we can achieve very good results in infested systems. The mode of action is to be compared with that against the legionella. However, the removal of the biofilm is even more demanding. This is mainly due to the fact that the bacterium or other microorganism living in it have developed strategies for self-protection. This slimy film, for example, offers good protection against thermal remediation. Some spores are even more resistant to heat than the bacterium itself. This means that problems with a biofilm struktur cannot be solved overnight. With the Merus Ring we can prevent the biofilm even in sewage systems. And stop biofouling. Today, we have numerous applications in which the biofilm has been minimized so that it no longer causes any problems. In some applications the biofilm was even completely removed. Even if the chemical dosage has been completely discontinued, the results obtained are very stable and satisfactory. Long-term results and measurements also speak for us. Some projects show excellent and stable results for more than ten years. The picture above shows a piece of pipe cut lengthwise. The Merus Ring was previously installed in the middle of this pipe section. The left section shows many small and medium white dots. In the middle, where the ring was installed, there is almost no biofilm. And in the right section behind the ring there are even fewer, smaller dots. Unfortunately, the complete system is not biofilm-free in this application. In untreated sections, the biofilm can continue to grow undisturbed. With very large systems, the range of effect is limited. This means that in order to completely control the biofouling process, the entire pipeline system must be equipped with several Merus Bio rings. If only one Merus Bio Ring is installed on a pipe string, the spread is only restricted. It is also difficult if the feed water is contaminated. However, the biggest advantage is still that the Merus oscillations spread even in stagnant water. This means that they also reach the dead legs*. It is precisely in these pipeline sections that the biofilm usually settles undisturbed. *Dead legs, from the English, for a part of a line through which there is no flow. This can be a branch line with a valve at the end, which is rarely or never opened.